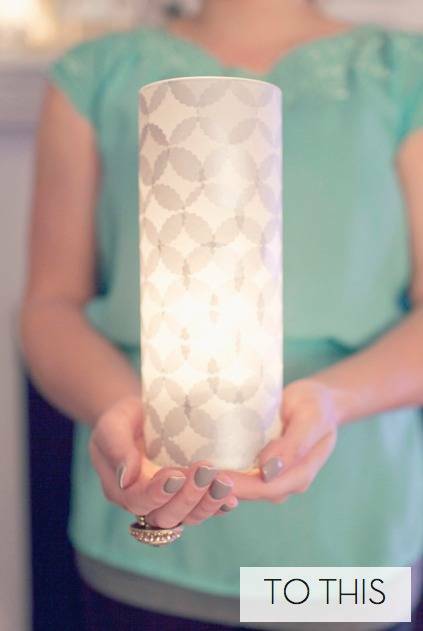 Rhiannon and her BFF Jenna turned a simple, clear glass cylinder into an elegant luminary using only tissue paper, Elmer's School Glue and a paper punch. Pretty enough for wedding centerpieces and/or mantle decor. What I love about this project--besides its beguiling simplicity--is that the luminaries are as pretty unlit as lit. For complete instructions, please visit Hey Gorgeous Events. I agree i love your site but the after picture would make the site more user friendly. I feel i spend more time getting to the meat of the projects instead of browsing the projects i want. Not worth my time and i finally get tired and leave. Can I say I love this site but the biggest annoyance is that you seem to insist on showing the before pictures to 'entice' us (what will it turn into?). But using the after picture works the same way (what was it before?) and has the added bonus that the first picture of the post isn't just some boring object. It literally makes your site more attractive.